Leveraging the same auto-follow ProPILOT technology that allows its vehicles to autonomously navigate traffic, Nissan has created a bunch of self-driving chairs that promise to make it a lot easier the next time you’re forced to wait in line. Waiting in line has mostly become a thing of the past thanks to the internet, but occasionally, there’s still the need to physically queue up outside a restaurant or a store, and if you find yourself in that situation you’re going to wish these chairs were there waiting for you. Packed with sensors making them aware of their positions in line, the chairs automatically advance when the next person in line no longer needs to sit, at which point their chair automatically rolls to the back of the queue. Does it make the waiting any easier? A little, since you’re not on your feet the entire time. 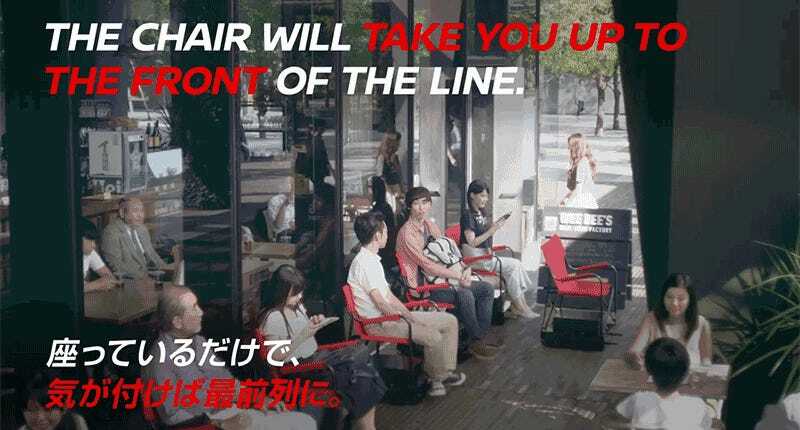 But that’s assuming the line never grows longer than eight or nine people since that’s apparently only the number of autonomous chairs Nissan’s advertising budget allowed for. The stunt is also supposed to show off the capabilities of the carmaker’s self-driving ProPILOT technology, but the chairs crawl along at snail-like speeds, and also don’t weigh thousands of pounds. So a collision while you’re sitting in one would be amusing at worst, and far from life-threatening.